I need to find 4 points in Latitude/Longitude format surrounding a given center point and a resulting algorithm (if possible). Known information: Equal distances for each "bin" from center of point (Radar) outward. Example = .54 nautical miles. 1 Degree beam width. Center point of the "bin"
I need to convert from Polar/Radial to Cartesian and I should be able to do that with this formula. So now all I need to do is find the "bin" outline coordinates (4 corners) so I can draw a polygon in a Cartesian coordinate space. I'm using Delphi/Pascal for coding, but I might be able to convert other languages if you have a sample algorithm. Everything is known in the above equation except rR. This should yield a quadratic equation with two solutions which you can easily solve. Those are your two corner points on the right side. Repeat step 3 with angle θC-0.5o to get the corner points on the left side. Not the answer you're looking for? Browse other questions tagged geometry mapping trigonometry cartesian-coordinates or ask your own question. 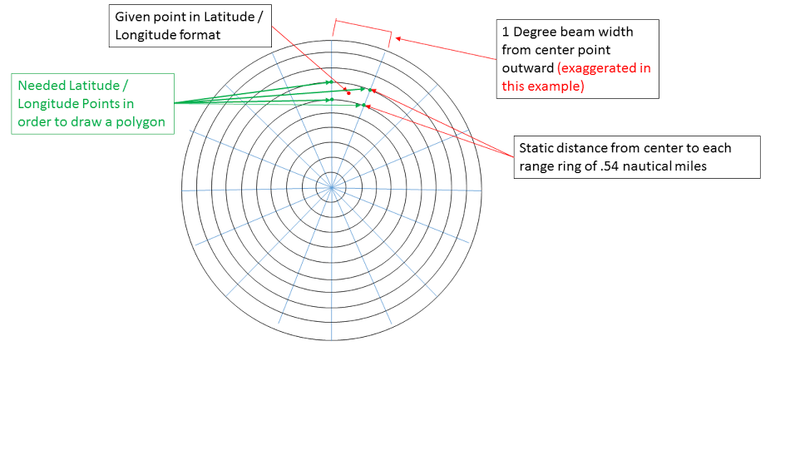 Checking if a longitude/latitude coordinate resides inside a complex polygon in an embedded device? How can I take a list of points that create a line and extend them into polygons inward of a certain length? How to correctly draw a polygon (lat/lng vertices and rotation) on a Leaflet map?